Have you ever known a person that could pickup virtually any woman at anytime and do it elegantly, effectively and almost magically? Have you aspired to have this power and even tried some of the same things that this person does only to wind up getting rejected and feeling lonely? Let me save you the trouble of trying to pinpoint exactly what it is that this person possesses because the truth is, it’s something that cannot actually be seen. You see, many people think it’s the words that this person uses so they try to speak like them. Others think it’s their body language or the way they dress so they attempt to replicate these characteristics. While all of these things certainly play a role in the outcome, the truth is there is one singular power that governs all of these things making them extremely effective. And that one thing is not visible to the naked eye. It is what’s known as an “unseen advantage”. And if you’ve been unsuccessful in the dating or social areas of your life, the truth is that you simply do not have that unseen advantage. The good news however, is that people are not born with this advantage. They cultivate, develop and master it. And much like them, you can do exactly the same thing. Relationships nurture the soul. As human beings, it is nearly impossible to function mentally without relationships or soul-links as I like to call to them. Relationships also help us to grow because we learn something new everyday by sharing experiences with others. But aside from all of that, deep meaningful relationships instill within us, a feeling of elation that nothing else in the world could match. You could have all the money, fame, fortune and material riches that you desire, but nothing can match the feeling of being truly loved. For that is what feeds the soul. The sad part is that many people in the world aren’t even close to experiencing deep meaningful relationships or true love. And part of the reason is that they can’t even achieve the first step which is meeting someone. In fact, more Americans joined online dating websites last year than any other year in history. Why? Because they felt they needed the help of a third party in meeting someone. Of those that join, only a few actually meet someone and go on a date. And of those that go on a first date, a good amount never go on a second one. Here’s another starling fact, almost 30% of the 80 million baby boomers in America are single. What that means is that at the later stages of their lives, a good amount of people are still looking for that certain someone special. And we all know how grim the divorce statistics in America are. What does this all translate into? Well first off, people need help getting dates. But aside from that, they need help making those dates successful and finally they need help finding the right person, building a relationship and making it last. You see, while mastering the art of the pickup is essential to increasing your odds of finding someone, there’s still so much more that’s involved in building deep meaningful relationships. That’s where Steve G. Jones and The Hypnotic Pickup Method can and will help. This program is the single most effective resource ever developed on mastering the art of the pickup and everything that follows. Why? You ask…..simple. This program will equip you with the hidden advantage that can be found in every person who consistently achieves success in everything they do. That advantage, which seems to flow effortlessly in some people, can be found residing in one place and one place only; and that’s in the mind. The achievement of every result we experience in life starts in the mind. After that, many other variables come into play but the outcome is predetermined in the mind. If your mind is programmed for success, then the other variables such as action, speech, body language, and physiology, will all fall into place. Sounds pretty simple, right? Program your mind for success and bang, you achieve it! So why is it that so many people still seem to be failing in the social aspects of their lives regardless of how much they program their minds for success or attempt a new technique at finding true love? The answer is simple. Relationships consist of more than just one person. Therefore, spending your whole life programming yourself for success in this area will amount to absolutely nothing unless you also learn how to program the minds of others for your success. That’s right. To achieve success and fulfillment in your relationships, you not only have to invest in resources to train your mind, you also need to learn how to get into the minds of others. That’s what the Hypnotic Pickup Method is all about. But aside from giving you the power to pickup virtually any woman that you desire, this program will improve your overall quality of life in general by helping you exude confidence in everything you do. Here you’ll learn the profound confidence building principles that Steve has been successfully instilling in others for years to help them get what they want when they want. Confidence is truly a wondrous thing. In fact, at times it can single handedly change the mindset of another party without you saying or doing anything. Truly a priceless characteristic to have! You’ll also learn how to improve yourself in every aspect so that you are not only confident, but certain about yourself and the qualities you possess. More important than finding someone, is finding THE one. Let’s face it, a major reason why so many people wind up alone is because they settle for someone that they really have nothing in common with only to realize the truth and waste years of their lives. 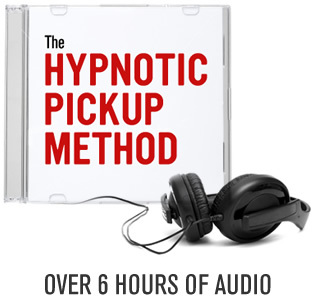 With the Hypnotic Pickup Method, you’ll be able to hone in on exactly the type of person that you desire and use the law of attraction to make them yours. In this module, you’ll discover everything you need to know about getting a date and making it a true success. From body language to flirting, from where to go on your on your first date to avoiding rambling; it’s all here. Rest assured, after module two, you’ll never be nervous about another date again. In fact, you’ll eagerly look forward to any and all opportunities to showcase your dating skills. Module Three will enable you to uncover everything you want to know about the other person during the second date. The second date is just as important as the first because during the first date, most people still tend to put up walls. On the second date however, you’ll be able to effectively uncover everything you need to know. You’ll also discover exactly how to make everything from a romantic dinner to cleaning the house together, fun and full of excitement. Here you’ll learn how to have a crystal clear vision of what you want before you approach someone and how to effectively communicate with them through use of words and body. After this, you’ll see your eyes, head, legs and hands in a whole new empowering way as they will serve as tools to almost magically engage the one you desire. NLP has been used by millions of people around the world to negotiate, converse, persuade and convince just about anyone to do anything by taking control of their thoughts. Steve is an expert practitioner of NLP and has structured the Hypnotic Pickup Method to be centered around the techniques encapsulated in NLP which will empower you to master the art of seduction and flirtation. Once you’ve mastered all the mechanics of the Hypnotic Pickup, Steve will then sharpen your saw even further through the advanced techniques. Your time has come. If you are ready to meet and attract the woman you desire and deserve, wait no more. Order the Hypnotic Pickup Method right now and look forward to a fulfilled, joyous, fun life that you can share with someone else.